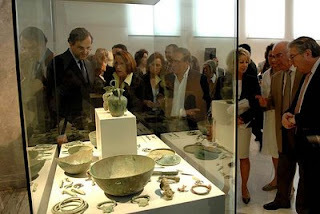 The Hellenic Minister of Culture, Antonis Samaras, was present at the National Museum in Athens today (May 19, 2009) to receive the return of antiquities from Belgium, Germany, and the United Kingdom (see press release in Greek). The finds from Germany, some 96 pots and bronzes, were seized in a lorry at Nuremburg; they apparently came from a cemetery in Thessaly. The iconostasis from the UK appears to have come from a Byzantine church somewhere in the region of the Plaka. Samaras spoke about the international co-operation to return cultural property to Greece - and thanked all those who were involved. Image from Hellenic Ministry of Culture.